ChargeIt by Jay Silver Tiled Round Melamine Charger Plate 13"
Home > Products > ChargeIt by Jay Silver Tiled Round Melamine Charger Plate 13"
Whether used for relaxed dining, festive entertaining, or high-end events, the ChargeIt by Jay Silver Tiled Round Melamine Charger Plate 13" is a beautiful piece for your dinner table. 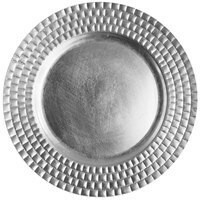 Boasting a timeless tiled rim with a stunning silver finish, this charger plate adds a lush detail to any upscale table setting. Thanks to its lightweight, shatterproof melamine construction, this premium quality charger plate is a highly durable and luxurious addition to wedding receptions, engagement dinners, and high-class restaurants. Perfect for any standard size plate or platter, this charger plate provides the perfect harmony of aesthetics and function. To keep this charger in excellent condition for a long period, this charger plate must be hand washed only.